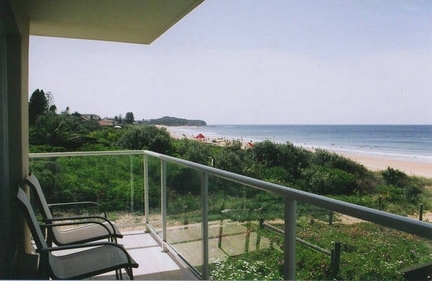 Located between Manly and Palm Beach on the Northern Beaches of Sydney just 23kms (30 minutes drive) from Sydney CBD.Two bedroom fully furnished and equipped apartment, perfect position right on the beachfront. Light, bright, first class north facing aspect, unique views of the beach & ocean from every room. Private, comfortable accommodation ideal for short term lease or a holiday by the sea, all you need is your personal items and food. Once you close the door and enter the living room the four picture window view will take your breath away. Includes 1 queen size bed, 2 single beds, bathroom, living/dining, kitchen, laundry facilities, balcony, 1 carport space. Limit 4 people. On the western side of the peninsula are Narrabeen Lakes, picturesque walking tracks, a haven for waterbirds, anglers, canoeists and sailboarders. Short walk to shops, fine dining and live evening entertainment at ‘The Sands' Hotel Resort. South to Long Reef Golf Course and Collaroy Movie Theatre. Perfect climate all year round, mild in winter, invigorating in spring, exciting in summer and relaxing in autumn.